I want to get the four quality dimension values of the model I mined,so I use the "evaluate process tree"plug in. But I get a non-visualized result.and he also can not be operated. I want to know where the problem is. Please us the 'calculatePTQualityString' variant which returns the tree fitness as a string representation. I don't understand what you said. Where can I find the 'calculatePTQualityString' variant ? In fact, I have found plug-ins to measure the other three quality dimensions, only don't know how to calculate the simplicity . For the simplicity metric, you can find the definition from "On the Role of Fitness, Precision, Generalization and Simplicity in Process Discovery". http://wwwis.win.tue.nl/~wvdaalst/publications/p688.pdf. I guess you need to implement it by yourself. I have read it.And now I almost know how to calculate manually. But it is better if there is a plug-in I can use. The plug-in I mentioned should produce a string with four quality dimensions encoded within it. I guess it's not available in ProM lite, but should be in ProM 6.7. The resulting string should contain all four quality dimensions. I think that the plug-in you said is the plug-in for the image I uploaded earlier. But it is unreadable and inoperable. I don’t know where the problem is. The plug-in you have executed now returns a 'TreeFitness' object. For this there is indeed no visualizer or plug-in that takes this as input. There should be another plug-in in the list with a very similar name that produces a 'String' object, which can be visualized. Can you check? The 0,3529 is the overall quality value, but I am not sure which of the Gv, Pe, Fr, Su stands for Replay Fitness, Precision, Simplicity and Generalization. I have looked into the source code but did not get any wiser. Does anyone know what these values mean? Thanks Eric! You're right. See the ETM folder and then the fitness.metrics package. Each metric has an info object with a key ('Gv'), dimension ('Generalization') and description (as Eric showed). The default weights to calculate the Of is (off the top of my head) 10 x Fr + 5 x Pe + Gv + Su normalized by dividing by 17 (sum of the weights). Thanks guys. Unfortunately, the "evaluate_process_tree_returns_string(log, tree)" variant does not work correctly in my case. Applying ETMd to one of my workflow logs results in the following output, where it states that the resulting process tree has an overall quality of >0.97 (great!). 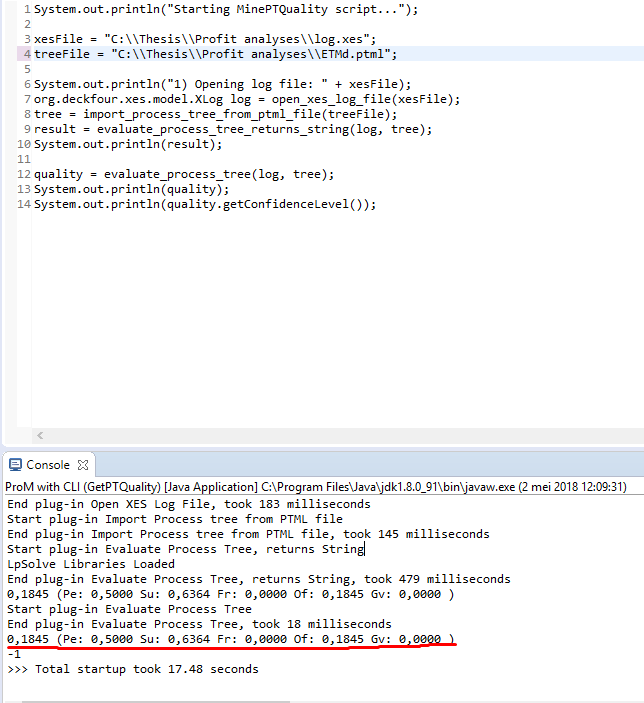 However, when I export the resulting process tree to a file (ETMd.ptml) and use the same workflow log file and process tree as input for "import_process_tree_from_ptml", then the algorithm returns a quality of only 0.1845... Any idea if I miss something? The image beneath shows a ProM script, which I use as input for ProM CLI. The console contains the output from ProM. When exporting a process tree from ETM as ptml there is a conversion from the ETM internal model (NAryTree) to a ProcessTree instance. Given the fact that your Fr is 0 in your recalculation I guess that the alignment settings are not correct (my guess: the XEventClassifier). My recommendation would be to hack a bit into the code and work directly with NAryTrees. I have save and load functions, even functions to translate NAryTrees to nice looking LaTeX pictures, even with quality values etc. etc. See my thesis for the end result and the ETM and JoosBuijs packages for the code.